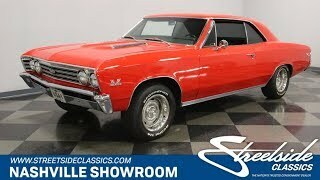 Hi, I am interested in your 1967 Chevrolet Chevelle SS (stock #1131-NSH) listed on Autotrader for $38,995. I'd like to get more information about this vehicle and confirm its availability. The 67 Chevelle is considered by many classic car enthusiasts to be the best-looking muscle car of all time. Being a true 138 SS car makes it even more desirable and coating it in shiny Red paint is just icing on the cake. Check it out. Before the paint went on this car it was prepped properly to make sure all the body panels were smooth and lined up properly so that once it was sprayed, the light would reflect off of it and flow smoothly over the bulging contours of the fenders and down the side of the car. The chrome also shines like new with the bumper up front underlining an SS grill with dual headlights on each side. The trim around all the glass received its share of elbow grease to make it shine too and wheel well and rocker moldings compliment Chevelle Rally wheels with polished trim rings and center caps. Super Sport appears on the rear fenders and the flying buttress roofline looks great from the side as it blends smoothly onto the trunk. At the rear, a rectangular black panel has SS 396 in the center with delicate chrome piping edging the panel out and dressing out the taillights. The rectangular theme continues in the interior which lends a rock-solid look and feel to it. Open the door and you will see this in the door panel of horizontal lines with a splash of chrome across the top. The seats have horizontally sewn center panels with smooth vinyl surrounding it. Have a seat and reach out for the black and chrome 3-spoke steering wheel the SS center button and check out the dash. It has chrome piping lining out rectangular panels for the horizontal speedo flanked by the engine gauges on each side of it as well as the controls in the panel above it that runs all the way across. The key is in an interesting place toward the middle of that upper panel to the right of the steering wheel. Below it in a center console is a T-handle shifter for the 3-speed automatic transmission. A sharp looking headliner ties everything together nicely and bowtie floormats keep the carpets protected. Pop the hood and you will find a well dressed 454 cubic inch motor nestled down in a neat and clean engine bay that has been nicely detailed out. There is a chrome air topper with crossed racing flags and Turbo-Jet 396 Horsepower sticker feeding air to an Edelbrock 4-barrel carburetor and out through stock exhaust manifolds with Flowmaster mufflers downstream adding a nice sound to things. There are chrome valve covers adding their splash of flash to the engine bay and yellow ignition wires reach out from behind the filter. The engine iron is all painted the correct color of Chevy orange and signs of good maintenance include new belts and hoses. Power flows back through a 3-speed automatic transmission to a 10-bolt rear end sitting on coil springs with trailing arms. Up front control arms with coils springs handle steering duties assisted by a power steering pump. The car sits on those good-looking stock steel wheels with polished trim rings and center mounted with BFGoodrich 235/60R15 radials all the way around. Classic good looks, sharp Red paint, and a serious motor. Whats not to like? Come on down and check this car out.